In the present collage entitled Entrance Ticket (Mz 456), the artist has “pasted” several documents. One of them — which gives its name to the composition — is a ticket for the Museum für Kunstund Kulturgeschichte in Lübeck, which first opened in 1915 in the Gothic monastery of Saint Anne showing fifteenth- and sixteenth-century works. It also features the syllable “ma, ” an allusion to the avant-garde review MA to which Schwitters contributed in 1922 and 1923; a piece of blue paper bearing the number “1549, ” placed vertically, which Christopher Green interprets as an intentionally false signature in the form of a monogram; and a cut-out picture of a dog with a rat in its jaws, which symbolises the element of irrationality with which the artist wished to infuse his works. Lastly, the typed letters “nschke” in the upper left corner can be connected with the phonetic poems Kurt Schwitters experimented with following his trip to Prague with Hannah Höch and Raoul Hausmann in 1921, during which he attended the Dadaist performance in which the latter read his poem fmsbw. 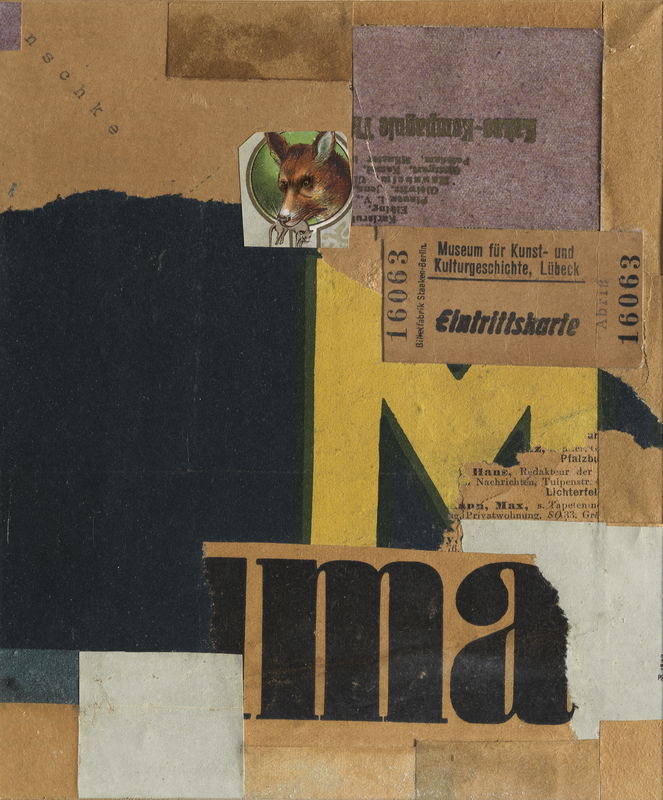 Nevertheless, although Schwitters’ contact with Huelsenbeck, Hausmann and Höch in 1918 had marked the start of his affiliation with Dada, the invention of the Merz artistic language and the creation of his phonetic poems, his lack of political commitment was never approved of by the Berlin Dadaists.